This week we step into the master bedroom of our South Austin Modern Farmhouse project. Like most of the main spaces in this home, our clients wanted their master bedroom to have a cozy feel and neutral color palette. We brought in pieces that would soften the modern elements of the space. Here’s a look inside. The barn door was an existing element of the space. Its sleek lines keep with the refined and modern feeling of the home. To keep the space from being too cold, we selected furnishings and details that felt more comfortable and inviting. The furnishings have classic lines and special details like any farmhouse should. The white chests have carved detailing for texture and depth. 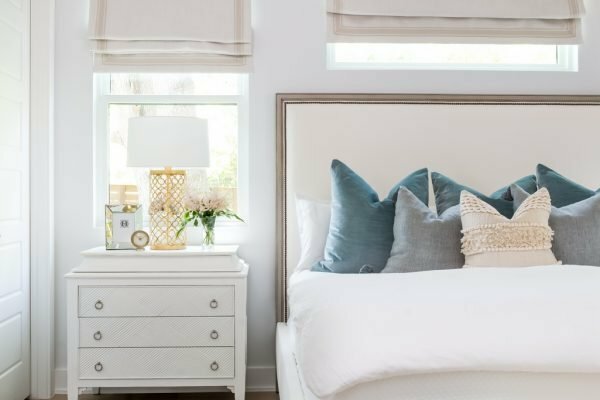 Brass hardware and gold lamps that sit atop the bedside tables warm up the sunny bedroom even more. The gray velvet tufted bench adds another thoughtful nod to traditional farmhouse decor. The master bedroom also had three windows that framed the bed. Instead of traditional draperies, we opted for roman shades with a neutral tape detail on each window. It still makes the space feel soft and finished. It also adds a tailored touch to the space. A mix of soft/blue grey pillows sprinkle in some contrast and color to the bedscape. The ivory textured pillow packs in a lot of charm and texture to the casual and dreamy room. This was such a fun project to work on and showcase! Your home should reflect your preferences and tastes. If you have a space that needs a little guidance, our team can help. Start with this quick and easy questionnaire so we can assess your project and tailor our services to your needs!